Areas to be worked on should be swept with a soft brush to remove any debris or sharp fines that may be laying on the surface. As well as the area to be repaired the surrounding area should also be swept to reduce the chance of bringing debris back into the work area. The membrane should then be washed with a suitable cleaning detergent mixed with warm water. The area should be scrubbed and rinsed down to ensure all contaminants are cleared from the area. Once fully dried the area should be wiped with lap/seam cleaner on a clean cloth and the surface should be left exposed for a minimum of 30 minutes to allow solvents to fully dry. The new membrane should be cut off the roll and trimmed to suit requirements. 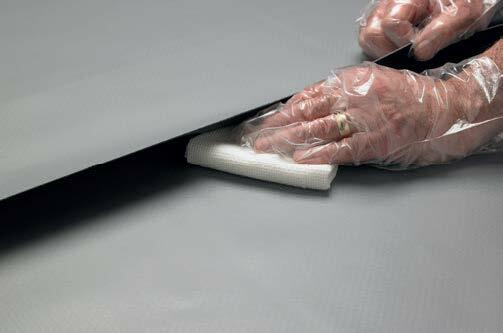 If cut from a new roll, cleaning of the new piece of membrane should not be necessary, rolls that have been left exposed should be wiped with seam cleaner as described above. Whilst waiting for the cleaner to dry a test weld must be carried out to determine the correct settings for the ambient temperature. Once set up correctly the membrane should be set in place and tack welded to hold its position. The welding process should comprise of a pre-weld set in at a distance equal to the width of the nozzle being used, complete the weld ensuring the full width of the nozzle is maintained in the overlap throughout. The weld is consolidated using a silicon roller to apply even pressure throughout, sweeping the edge of the roller back and forth no further than 20mm from the edge of the nozzle. Once cooled check the weld for any loose or un-welded sections using a flat bladed screwdriver or a suitable seam probe. Although patch repairs are seen as a weakness they are in fact homogeneously welded and form an integral part of the system. Click here to download this technical bulletin in pdf. If you have any queries, please contact our Technical Services Team.